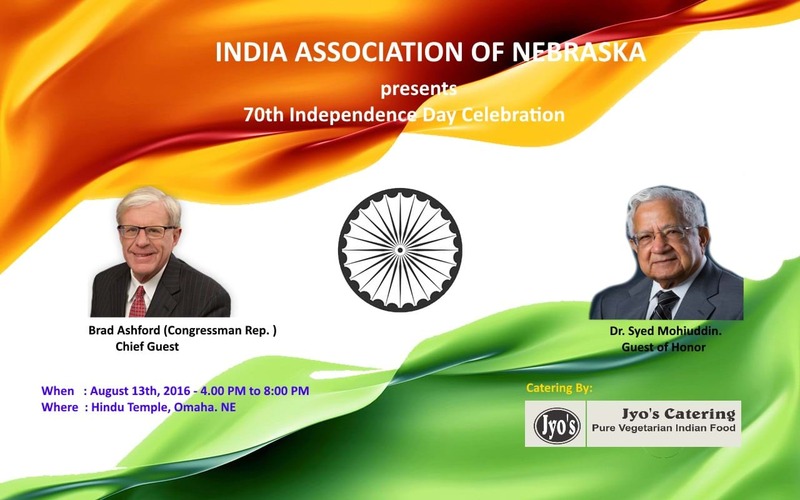 India Association of Nebraska (IAN) cordially invites you to celebrate India’s 70th Independence Day on Saturday, August 13th, 2016 at 4.00 PM at the Hindu Temple -Social Hall, Omaha. The Chief Guest for this patriotic event will be Congressman Rep. Brad Ashford and the Guest of Honor will be Dr. Syed Mohiuddin. Delicious Indian cuisine catered by Jyo's catering at a nominal price. Through the cultural events - let us revel in the freedom and glory regained by our freedom fighters. We hope to see you all to show our solidarity to our great Nation.